Google’s Pixel Buds, the company’s first attempt at wireless earbuds, suffer from a variety of issues. The charging case feels flimsy, stowing the wire around the case is a chore, we often run into pairing issues, and the earbuds don’t always have the best fit. They also cost $159 – they’re still sold on the Google Store — which is the same price as Apple’s superior “true” wireless AirPods. Instead of taking another stab at a wireless product this year, Google went the simpler route with USB-C wired earbuds that are now included with every purchase of a Pixel 3 or Pixel 3 XL smartphone. You can also buy them for $30, and all features work on phones running Android 9 Pie or, eventually, higher. We’re quite happy with these affordable and wired buds. 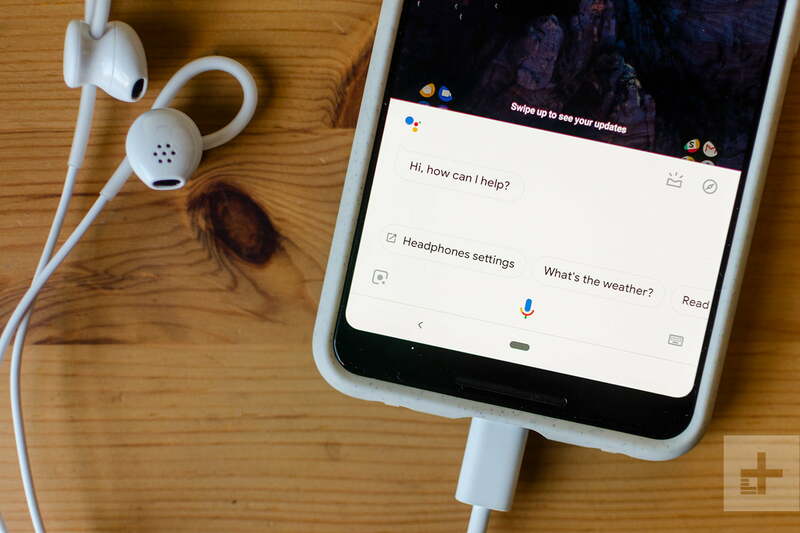 Google has ported over many of the smart Google Assistant features that debuted in the Pixel Buds and make the earbuds even more useful, whether you’re listening to music or not. The sound quality is a bit better than what you get with Apple’s Lightning EarPods, and you don’t need to worry about charging or pairing. Google has carried over the “open-ear” style it used with the Pixel Buds to the USB-C earbuds. If you want earbuds that can block out the rest of the world, look elsewhere. We like being able to hear our surroundings, which is intended with this design, as it helps us stay aware in the bustling streets and subway stations of New York City. There were only one or two times we weren’t able to hear our music at full volume, and it was when the subway was pulling up at the station. This style also means the earbuds leak sound, though not as much as Apple’s EarPods. They still might not be ideal for an open office where your co-workers don’t share your same indelible love of ABBA’s greatest hits. The Google Pixel USB-C earbuds also share a similar design aesthetic to the Pixel Buds, except they’re much more miniature. There’s still a loop you can adjust to help keep the buds in your ear, but there are no touch controls. They also look a bit plain, with an all-white design that makes them easy to mistake as Apple’s EarPods from afar. We would have liked to have seen some visual flair here, like the colored power buttons on the Pixel phones. The fit in the ear is comfortable, and we’ve never had the earbuds fall out — the adjustable loop helps make sure they stay in. Over time, they slide slightly away from the ear canal, and we found ourselves pushing them a tad inwards every now and then. This may depend on how the earbuds fit in your ear, though. Quite frankly, Google’s in-ears sound much better than they have any right to given their $30 price tag. Based on their look, we expected a similar tinny sound signature to Apple’s Earpods, but we couldn’t have been more wrong. As soon as we popped them in and pressed play, we found an exciting and vibrant soundstage worthy of actual praise. The Pixel USB-C buds punch well above their weight in terms of both musical weight and definition. We were astonished at the amount of low-end these eartip-less headphones could provide. They smack the meaty bass lines from Dr. Dre’s The Chronic and Outkast’s Southerplayalisticcadillacmusic out of the park, providing one of the most enjoyable listening experiences that we’ve ever had on such a cheap pair of headphones. The high end is also something special, with acoustic guitars and string lines popping out of mixes like Star Rover’s densely layered new single Snow Moving, rather than glomming together in an overwhelming musical clump like they do on other affordable headphones. We also enjoyed listening to classic lo-fi recordings like Bruce Springsteen’s Nebraska on the little earbuds, which seemed to lend a more authentic “listening to a cassette player in the 1980s” experience to Springsteen’s gritty tape recordings. If you’re seeking a utilitarian pair of earbuds to throw into a backpack, laptop bag, or back pocket and not have to worry about, we think that these are some of the best-sounding you’ll find. You really do get significantly better audio quality than you’re paying for — especially if these little in-ears were included with your recent Pixel purchase. There’s a little button on the inline mic on the wire – just press it to play or pause music, and you can increase or decrease music volume by tapping the hidden buttons above and below. Our favorite feature is accessing Google Assistant, which you do by pressing and holding the black button. Having Assistant at the ready just a button away dramatically changes the way we use our phone. On phones running Android 9 Pie, just press and hold the button and speak a command, and Assistant will respond quickly. You can control your smart home products, get turn-by-turn walking directions, ask Google queries, play podcasts or music — basically anything you can do with a Google Home. Having Assistant at the ready just a button away dramatically changes the way we use our phone, as we often asked it to perform tasks like set reminders as we walked along a busy street. It’s great. 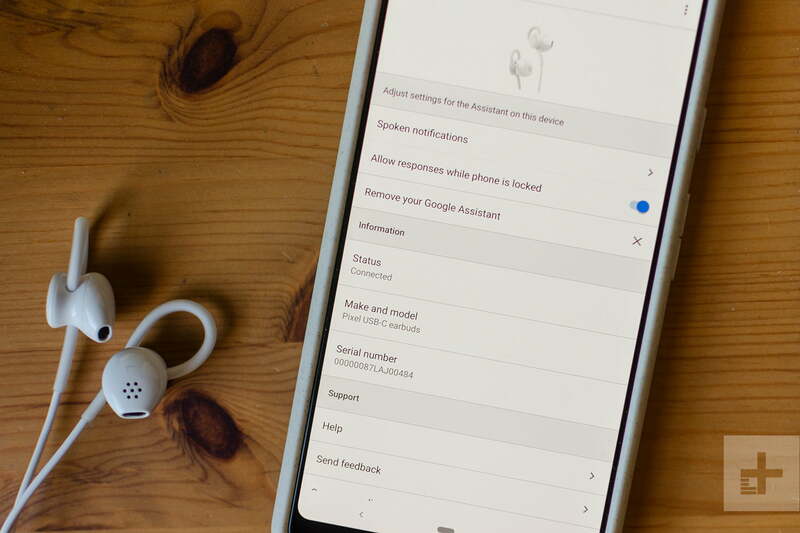 Accessing Assistant through the buds works with devices running Android 8.1 Oreo or lower as well, but you need to wait to hear a sound before you start speaking, and in general it’s just not as fast. You can also get real-time translations just by asking Assistant to help you speak a language. It’s powered by Google Translate, so the results are often a little funky, but it does the job, and it’s incredibly fast. It’s handy if you don’t know the language in a country, and the translated audio plays from the phone’s speaker so the person you’re talking to can hear it. What doesn’t work on phones running anything lower than Android 9 Pie is notification alerts. With Pie phones, Assistant will say the name of an app when you get a notification (you can choose which app notifications you want to hear), and if you press and hold the volume-up button on the inline microphone, Assistant will read out the notification. We love this feature so much we’ve found ourselves keeping the earbuds in our ears even when we didn’t want to listen to music, just to hear notifications as they come in because it meant we didn’t have to take out our phone. The downside is unlike the Pixel Buds, there’s no way to respond to notifications with your voice, which is disappointing. You can also press and hold the volume-up button at any time to hear the time and all the latest notifications on your phone. A simple tap of the black button on the inline mic will make Assistant go silent. The Google Pixel USB-C earbuds cost $30 and are available from the Google Store now. The Pixel USB-C earbuds do not require charging or pairing, which takes away a lot of the pain points we have with Google’s Pixel Buds. They sound good, are comfortable, have a good deal of smarts thanks to Google Assistant, and best of all, they’re affordable. Yes, but you may have to spend just a bit more. Shure’s SE112 cost $50, but they offer better sound and isolation. They will also work on a variety of devices as they use a 3.5mm headphone cable. Google’s Pixel USB-C earbuds are limited to computers and Android phones with USB-C ports. Check out our best cheap headphones guide for more. We do wish Google used a more durable material for the wire, as it feels like it doesn’t take much to break them. We expect them to last you one to two years, provided you care for them well. We know some people who’ve eked out years on their cheap earbuds, but the Pixel USB-C earbuds aren’t the most durable on the market. Yes, more so if you have a phone that runs Android 9 Pie. Chances are if you bought a high-end Android phone this year, you’ll be getting the upgrade at some point this year. Check out our guide to see when your phone will get version 9.0 Pie.